A classic Italian dish made vegan! 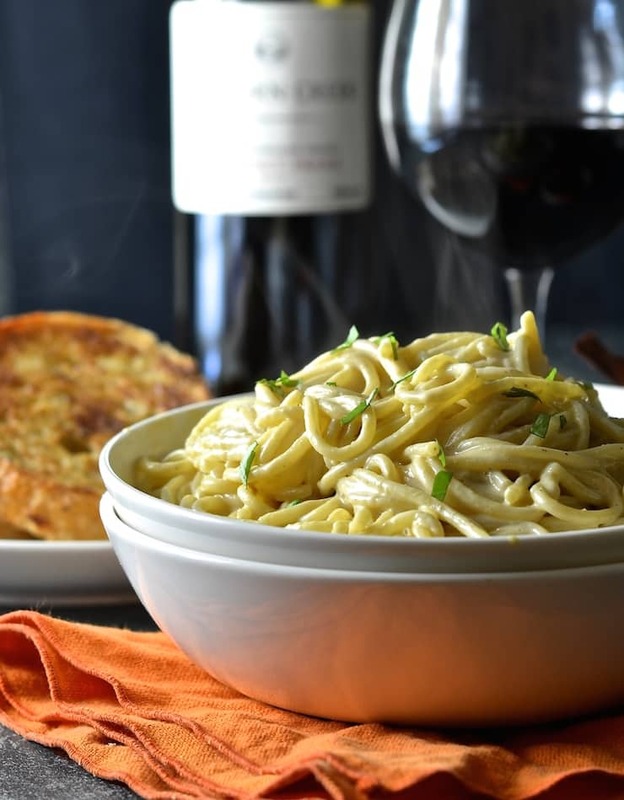 This Vegan Carbonara is so simple & yet so decadent, it’s magic. Add a scattering of smoky carrot rashers & you get a fantastic pop of colour & texture too! Carbonara is a very simple, classic Italian dish. It is traditionally made without the use of cream or milk and uses fresh eggs and parmesan. The eggs and cheese are beaten together in a bowl and added to cooked spaghetti. The heat from the spaghetti cooks the eggs and melts the cheese forming a sauce. Guanciale ( a cured meat) is also sautéed and added to the sauce. In my Vegan Carbonara, I use creamy cashews, buttery ground almonds and a little milk to replace the eggs. The cheese is subbed for nutritional yeast and the guanciale is replaced with smoky carrot rashers. I cook it in a similar way to traditional carbonara. The spaghetti is cooked until al-dente then the room temperature sauce is tossed through it. The heat from the spaghetti is enough to warm the sauce through. You don’t need lots of sauce. Italians don’t drown their pasta in gallons of sauce. They just use enough to coat it nicely and this is the best way to serve this dish. It’s quite amazing how similar this is to a traditional non-vegan carbonara. It is incredibly creamy with a delicious butteriness from the ground almonds. 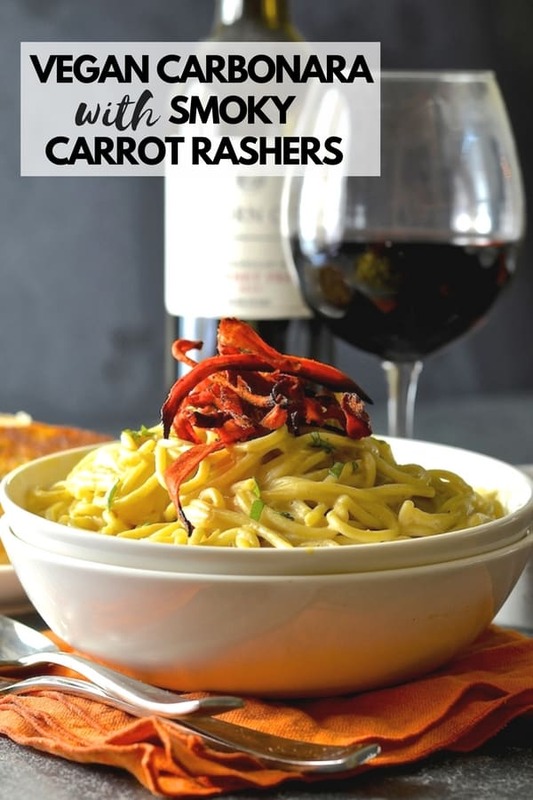 The nutritional yeast gives a subtle cheesiness and the carrot adds a satisfying smoky flavour as well as great texture and a pop of bright orange colour. The sauce even ‘behaves’ like carbonara sauce made with eggs and cheese. If you have ever made it you will know that once tossed through the pasta, if you don’t serve it immediately or you keep it on the heat, it kind of goes claggy and dry. The same happens with this vegan version. So, when you drain the pasta I suggest you reserve a little of the pasta water to dilute the sauce a bit. The starchy water acts as an emulsifier and adds a lovely gloss to the sauce as well as letting it down a little. It’s what Italians do and as they make some of the best food on earth who are we to argue? You might only need a drop but it’s better to keep half a cup of it aside just in case. This Vegan Carbonara With Smoky Carrot Rashers is so unbelievably good. It has minimal ingredients, minimal prep and maximum flavour. Because it is so simple and quick to make and looks so impressive with the carrot piled up on top it is great to serve at dinner parties. You can make the Smoky Carrot Rashers in advance then when your guests arrive all you will need is ten minutes in the kitchen and you’re done. Easy. More time to spend socializing and eating! 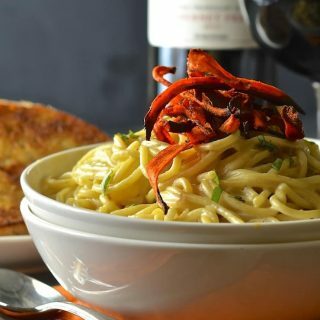 Serve this beautiful Vegan Carbonara with a big fresh salad, lashings of red wine and garlic bread and you will all be in heaven! If you love Italian food then be sure to check out my Garlic Mushroom Risotto. 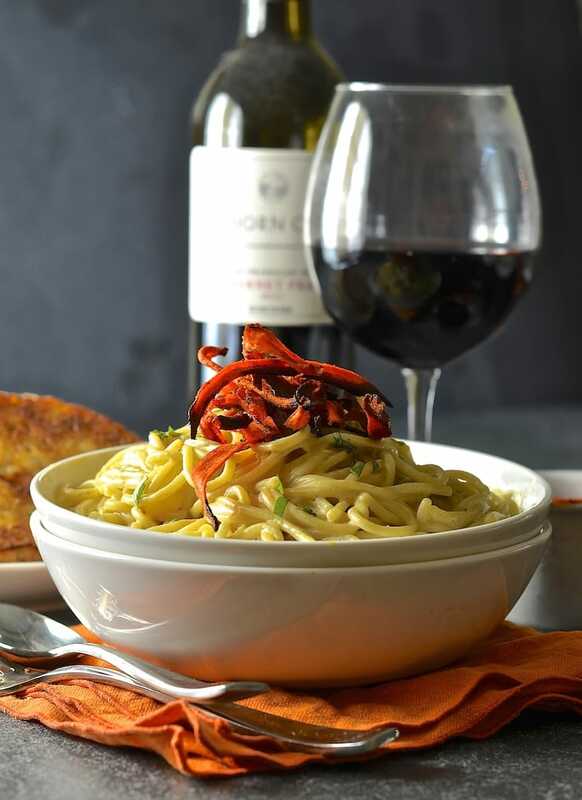 A classic Italian dish made vegan! 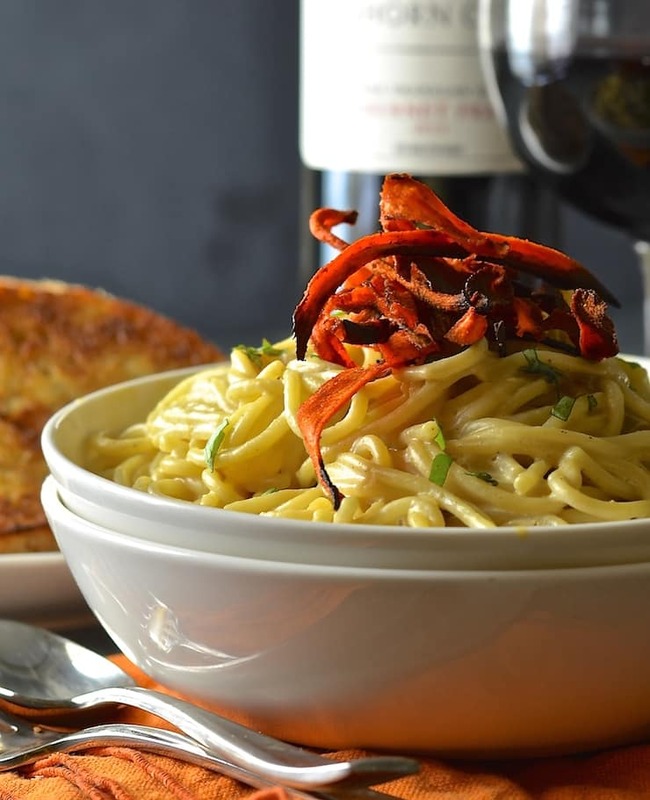 This vegan carbonara is so simple & yet so decadent it’s magic. Add a scattering of smoky carrot rashers & you get a fantastic pop of colour, flavour & texture too! 2 medium carrots , cut into very thin ribbons. I used a potato peeler to do this. 75g | 1/2 cup raw cashews (soaked for at least 2 hours unless you have a super duper blender like a Vitamix or Blendtec . If you forget to soak them then cover them in boiling water for 20 minutes instead). A little tiny piece of garlic. I had a medium sized clove and used just less than a quarter. It doesn't sound much but remember that the sauce doesn't get much cooking so the flavour will be too strong if you use much more. In a small bowl mix together the oil, maple syrup, smoked paprika and salt. Add the carrot rashers and massage them in the mixture. Spread the carrot rashers out on the tray in a single layer and bake for about 20 minutes, checking every 5 minutes or so and turning as necessary. They go from ok to burnt within what seems like seconds so keep a close eye on them. They won't go totally crispy while in the oven. As they cool some will crisp up and some will stay soft and chewy. Add them and all of the other sauce ingredients to a food processor or blender and process until completely smooth. When the pasta is al dente (cooked with a little bit of bite), drain it reserving half a cup of the pasta water. Add just enough sauce to the pasta to just coat it. Add a few drop of the pasta water to make it looser and glossier if you need to. Not too much though. You don't want a runny sauce. It needs to be clinging to the spaghetti not dripping off. A very neutral tasting milk is best and it must be unsweetened. I didn't like the results with almond milk as I think the flavour of it came through in the sauce. I tried a few different varieties and my favourites to use for this was soy milk or cashew milk. I tried this recipe today, loved it!! Think I could have blended the sauce longer to make sure it was completely smooth. The carrots made the meal perfect, will be making again and trying ALL your recipes over the next few weeks. That’s awesome! I am so glad you enjoyed it and thank you for stopping by to let me know! Oh my goodness, this is divine! Thank you so much for linking it to Pasta Please, it’s a total show stopper!